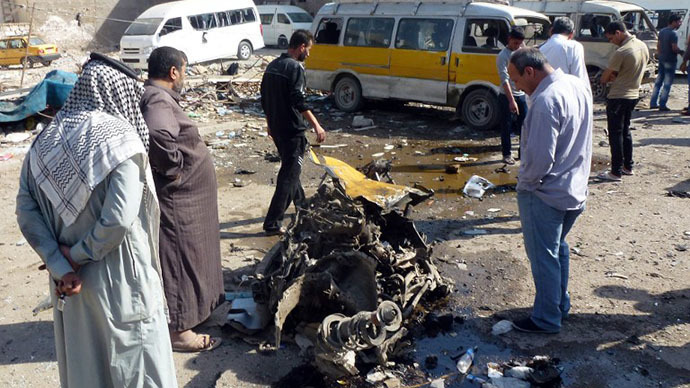 Ten car bombs ripped through the Iraqi capital, Baghdad, killing at least 42 and wounding dozens more, officials said. Further attacks, including a separate blast targeting soldiers in the northern city of Mosul, killed dozens more across Iraq. Nine of the blasts targeted predominantly Shiite Muslim districts over the course of half an hour, police said. The most violent of those blasts occurred in the town of Nahrawan, south of the capital, where two back-to-back car bombs exploded near a busy market, killing seven people and injured 15 others. 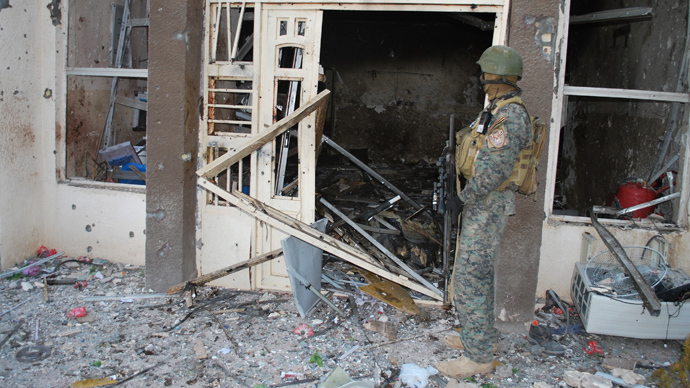 Attacks in the northern Shaab and southern Abu Dshir neighborhoods killed six people each. Other explosions hit the neighborhoods of Mashtal, Baladiyat and Ur in eastern Baghdad and the northern Sab al-Bor and Hurriyah districts. Six medical officials confirmed the casualty figures to AP. All spoke on condition of anonymity as they were not authorized to speak to the press. There was no immediate claim of responsibility, although such coordinated attacks have in the past been a hallmark of The Islamic State of Iraq and the Levant – al-Qaeda's local branch. Meanwhile, Sunday’s deadliest attack targeted soldiers in the northern city of Mosul, killing at least 14 people and wounding 30 others. A man driving a car packed with explosives blew himself up outside a government bank where soldiers were waiting in line to collect their salaries, Reuters cites police as saying. Five of those killed were civilians. In a separate incident, also in Mosul, gunmen killed two off-duty soldiers in a drive-by shooting. Later on Sunday, four people were killed and 11 injured by an explosion at an outdoor market in the Sunni town of Tarmiyah. In the evening, a further four people were killed and nine injured by a mortar shell that landed in a Shiite district of Madain. On Friday, a series of nine bombs detonated by remote control killed 16 people across the country as Shiite Muslims commemorated the religious festival of Al-Gadeer. Last week, a suicide bomber killed at least 38 people outside a cafe in a mainly Shiite Muslim district of Baghdad. Violence has spiked in Iraq since April, when tensions between Prime Minister Nouri al-Maliki's Shiite dominated government and Sunni groups claiming to be the victims of discrimination boiled over. Iraq is seeing its worst year of violence since 2008, when bloodshed leveled off following two years of intense sectarian violence which some scholars characterized as civil war. But while the upward spike in violence is universally recognized, determining exact causality figures in the country remains an inexact science. According to AP, today's attacks bring the death toll across the country this month to over 500. 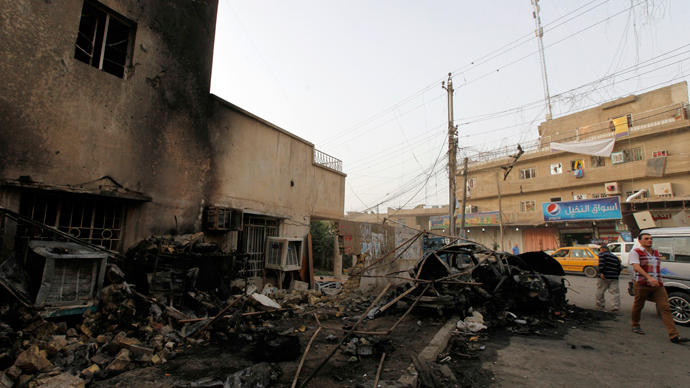 Iraq Body Count, meanwhile, which did not include Sunday’s violence in its tally, placed October’s death toll at 904.